Successfully Added Deluxe iPod and iPhone AV + USB Cable to your Shopping Cart. Deluxe iPod and iPhone cable for connecting to AV and USB devices. Per our customers requests, we are now happy to offer you additional iPhone and iPod accessories for making life easier. This great 2-in-1 cable allows you to send the video and audio from your Apple portable iLife product (iPod, iPhone) to an AV device such as a TV or stereo. In addition, it has a USB connection for connecting to you computer. Why carry around multiple cables when when one will do everything you need - and at a budget friendly price! We are offering this great new item at a quantity of at least 5 pieces in order to give you the absolute best re-sale profit margin from our low wholesale price and even better shipping rates. Brought to you from the leader in wholesale direct from China electronics, Chinavasion. 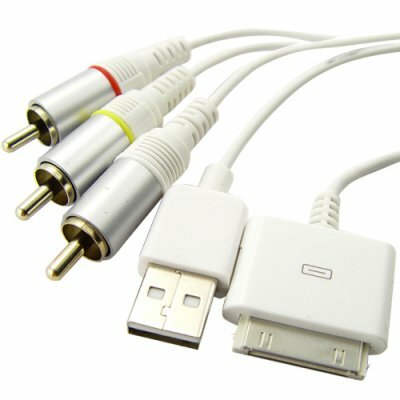 Video and audio output cable - enjoy your favorite digital media on a big screen! Two-in-one cable does everything you need - make your life simpler by only needing to carry around one cable.